When checking page layouts everybody wants to see their layouts as big as possible and sometimes wants to see the double page layout, just like a book ( 2 pages next to each other on one screen). Adobe Acrobat Reader in its recent version 7 doesn’t support this feature in their full-screen mode. So I had to search for some alternative PDF viewer. 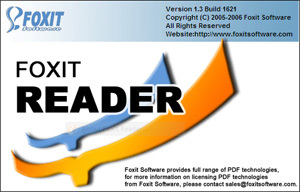 FoxitReader (Freeware) is fast, starts in a split second and features double-page facing in fullscreen mode. Don’t be afraid of the ugly web-site and the more ugly screenshot. On some properly theme-d Windows XP its looks really nice, even better than Acrobat with all its colorful buttons. This entry was posted on Monday, July 31st, 2006 at 3:00 pm	and is filed under reviews, windows. You can follow any responses to this entry through the RSS 2.0 feed. You can leave a response, or trackback from your own site. Thanks! I’ve been looking for an Acrobat alternative for a while now. go here for the top defender flashlight now in stock around and reasonably priced….